The Graduates Council Annual Discovery lecture for 2012, Dr. Wilson discusses the impact of Scott's expiditions 100 years on. A century after Captain Scott and members of his party met their tragic end on the Ross Ice Shelf, Dr David Wilson will relive one of the most epic tales in the history of human exploration. His lecture will re-evaluate the expedition and its remarkable impact on twentieth century science and culture. This lecture will have a uniquely personal flavour, since Dr Wilson, as well as being a respected Antarctic historian, is the great-nephew of Dr Edward Wilson, Scotts Chief of Scientific Staff and expedition artist, who died with him on their fateful journey back from the South Pole. 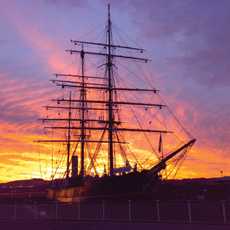 This lecture is this years Graduates Council Annual Discovery lecture, and also takes place in conjunction with Dundee Heritage Trust as part of their events to mark the centenary of Captain Scotts Terra Nova expedition of 1910-12.